US Secretary of State John Kerry, meeting the head of the externally-based opposition Syrian National Coalition, has promoted political talks on May 4 between a regime delegation and its opponents. They have agreed to be part of UN talks that will take place over the course of the next weeks and month. And we very much hope that in the immediate days ahead, that people will be able to find a new path by which to create an outcome that will restore the secular, united nature of Syria and be able to prevent this extraordinary humanitarian catastrophe that is unfolding before the world’s eyes. UN envoy Staffan de Mistura has been trying to convene the “Geneva III” talks, following the failure of his initiative to obtain a “freeze” on fighting in Syria’s largest city Aleppo. Syria’s ally Iran has also been invited to attend. The Coalition has said that it is willing to go to Geneva. 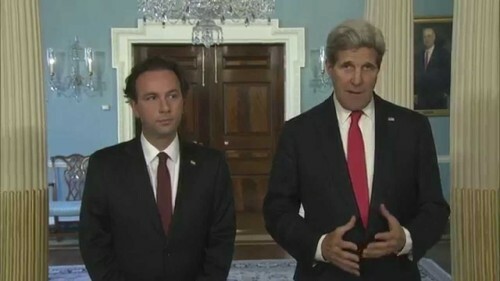 However, Khoja made no reference to the talks, preferring to Washington for its provision of more than $3 billion and “to ask the assistance of the US in establishing safe havens in liberated areas”. This is a regime that has lost all sense of any kind of responsibility to its own people, and that is why there must be a transition from the Assad regime towards a government that represents all the people and can repair this extraordinary damage to Syria, unite the country, protect all minorities, and provide a legitimate future. But he did not mention significant rebel advances across Syria, including the capital of the provincial capital Idlib and other key cities, towns, and regime bases in the last month, or even the long-delayed US initiative to train a force of 5,000 fighters. On the battlefield on Thursday, rebels and regime forces continue to fight in the al-Ghab Plain, south of the city of Jisr al-Shoghour which was taken by the opposition last week, as the Syrian military tried to preserve a link between southern Idlib and Latakia in western Syria on the Mediterranean coast. Pro-Assad outlets also claimed a regime fightback in northern Latakia Province, pressing upon the rebel position in Salma. Pressing their offensive south of Idlib city, rebels have taken Mount 40 near Ariha. A rebel assault on Ariha, one of the last towns in Idlib Province held by the Assad regime, is expected soon. Activists claim that rebels have stormed the last holdout of regime forces in Jisr al-Shughour, captured by the opposition last weekend, with an assault on the National Hospital. 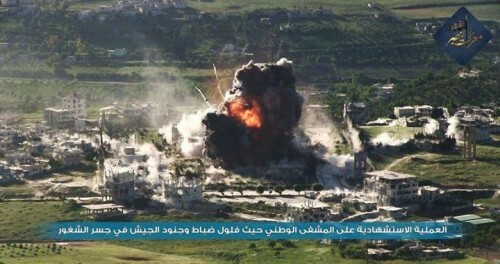 The final attack on the hospital was said to have begun with a Jabhat al-Nusra vehicle-borne bomb. Scores of regime troops were reportedly captured. One rebel outlet says more than 250 soldiers<, including high-ranking officers, were in the building. Opposition activist Mohammed Oun, also known as Rayan, has spoken to The Independent of London about being detained and abused by Jabhat al-Nusra, following the Islamist faction’s storming of a protest in Aleppo earlier this month. They brought along an informer who accused me of spying on al-Nusra, being a kuffir [an unbeliever], all kinds of things. So, I was found guilty very quickly. “At that point the man questioning me took off his mask. Now, I began to feel frightened, he was willing to show his face to me, I thought for the first time that I wasn’t going to get out alive. There was a tremendous feeling of hopelessness, I knew I must fight against it…. [The beatings, including with a cable] went on and on, but it was probably about two hours. I tried to shut my mind, but the pain gets through…. [A subsequent beating with a heavy stick] was worse than anything before, and I began to pass away. As I was fading away I could hear one of them complaining that I was fainting too soon. The Local Coordination Committees say 73 people were killed on Thursday amid regime bombing across Syria. Of the deaths, 32 were in Aleppo Province, 15 were in Idlib Province, and 13 were in Hama Province. Syrian State news agency SANA says seven people were killed and at least 35 wounded in Aleppo city on Thursday by rockets fired by rebels. The agency also says one person died and six were injured in rocket attacks in Daraa in southern Syria.